Members of the 2018-19 Colorguard meet, many for the first time, as part of the Band icebreaker on Monday, May 21. 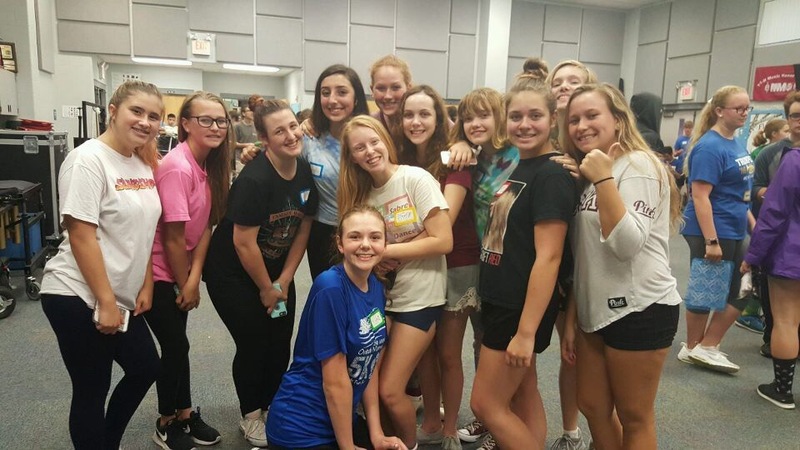 On Wednesday, May 16, former and upcoming band and colorguard members met in the band room from 5 to 7 p.m. to become familiar with what will soon become their “band family” over the next couple months marking the beginning of band camp. The icebreaker served as an opportunity to hear the show theme for the first time and receive packets regarding the expenses and schedule. The halftime show was announced to be, “An American in Paris,” a Broadway musical and movie released this year that garnered mixed opinions among the members. “The show’s theme has a different vibe to it but definitely has potential,” freshman Dessa Dixon said once listening to songs from the musical and comparing it to the previous year. Section leaders and captains treated their group with items like nametags and treats and later split into groups across campus to play get to know you games. Some of these games were telephone, speedball and a hot potato rendition with a volleyball. Sections went around in a circle stating their grade, instrument and other facts about themselves before meeting back at the cafeteria picnic tables. A game played towards the end of the event – the scavenger hunt allowed for incoming freshmen to get a feel for the school and interact with current members. Due to heavy rain, members were instructed to stay under the coverings during the scavenger hunt that later revealed the word ‘guidance’ after collecting each letter. Members will meet back in the band room May 23 for registration before preparation for the August halftime show.